The Supreme Court today decided to examine the allegations of interference with investigation of the coal block allocation scam by former CBI Director Ranjit Sinha. It also decided to look into the application filed by Mr. Sinha against the NGO (Petitioner) and its counsel Prashant Bhushan for perjury. This matter is now listed for February 16, 2015. “a) Direct Mr. Ranjit Sinha, Director, CBI, not to interfere in the coal block allocation case investigations and prosecutions being carried out by the CBI and to recuse himself from these cases. b) Direct an SIT appointed by this Hon’ble Court to investigate the abuse of authority committed by the CBI Director in order to scuttle inquires, investigations and prosecutions being carried out by the CBI in coal block allocation cases and other important cases. Senior advocate Amarender Sharan, appearing for the CBI, contended that several contents including one about him in the abovementioned application and Mr. Bhushan's note, which he read out in Court, were factually incorrect. Mr. Sinha’s counsel Vikas Singh contended that judicial record spoke for itself that "false and malicious" allegations have been levelled against Sinha and it cannot be that "just because he is Prashant Bhushan he can get away with any lie". The Special Public Prosecutor appointed by this Hon’ble Court in the 2G cases, Mr. Anand Grover, confirmed that the conduct of Mr. Sinha was far from proper and amounted to serious interference in the 2G investigations and trial. Hence the Hon’ble Supreme Court vide order dated 20.11.2014 was pleased to allow the removal of Mr. Ranjit Sinha, Director, CBI, from the 2G case investigation and directed Mr. Sinha not to interfere in the 2G case investigations and prosecutions. Therefore Mr. Bhushan argued that the application in the instant case should also be treated on a similar footing and a decision arrived at by the Bench. In the coal scam investigation it came to light that Mr. Sinha, along with a few other senior officers of the level of the Joint Director, repeatedly overruled the investigation officers and forced them not to register FIRs/RCs in cases where PEs had been registered. He even forced them to file closure reports in cases where FIRs had already been registered. On this basis, this Hon’ble Court, vide order dated 28.03.2014, directed the CBI to submit their reports to the Central Vigilance Commission (CVC) in cases where Inquiry Officers had recommended registration of a Regular Case, but had been overruled by the CBI Headquarters. With this regard, the CVC has agreed with the investigation officers and recommended the registration of Regular Cases in as many as 14 such cases in the first instance, including the one against SKS Ispat (where former union minister Mr. Subodh Kant Sahaya is the accused). This Hon’ble Court has directed the CBI to abide by the view taken by the CVC. Therefore this order goes to show that the decisions taken at the level of the CBI Director and other senior officers to close these cases was wrong and amounted to subverting the process of investigation. Further it has come to light that the Special Public Prosecutor appointed by the Supreme Court in the Coal Scam cases, Mr. R S Cheema, has disagreed with the decisions of Mr. Sinha to file closure reports in several FIRs despite the fact that evidence of criminal culpability had been found against several companies, influential accused and public servants. Reportedly, Mr. Cheema has written as many as six letters to Mr. Sinha concerning these closure reports. The petitioners in the said application had also pointed out that the entry register of 2013 and 2014 maintained at the gate of the official residence of the Mr. Sinha at 2, Janpath, New Delhi, shows that he was having meetings, several of them late at night, at his residence with several accused persons in prominent cases like Coal Scam, 2G Scam, and with Hawala operators like Mr. Moin Qureshi, without any of the investigation officers being present. The meetings between the Dardas and Mr. Sinha must be seen in conjunction with the u-turns that were taken by the agency in the case against them. By 7th October 2013, both the SP and the IO had recommended chargesheet in all the three cases against Dardas/Jaiswals, MOS Coal, Coal Secretary etc. Senior PP had recommended prosecution in two out of these three cases. Mr. Vijay Darda, thereafter, according to the entry register met Mr. Sinha on 22nd November 2013. File was with the DIG at that time who again recommended chargesheets in all the three cases on 5th December 2013. However, on 6th December the HoZ/EoZ marked it for another legal opinion of ALA Mr. Sudhakar which has uncalled for, at least in the two cases where there was no difference of opinion. On 22nd December 2013, Mr. Vijay Darda again met the then CBI Director Mr. Sinha. On 13th January 2014, ALA opined that out of three cases only one is fit for prosecution. After this, on 28th January, Mr. Darda met Mr. Sinha once more. Two days later, on 30th January 2014 JD-HOZ/EOZ-1 Mr. O. P. Galhotra supported the view taken by ALA and marked the file to AD-CBI. The AD-CBI Mr. R K Dutta did not approve of the decision of the JD Mr. Galhotra, and he asked for further investigation in the matter. The file was marked to the Director CBI Mr. Sinha. Then, Mr. Sinha met Mr. Devender Darda four times on 2nd, 3rd, 6th and 8th of February 2014. After these 4 meetings, Mr. Sinha, on 13th February 2014, overruled both the DIG and AD Mr. Dutta, and said that two out of the three cases need to be closed. He stated that there was no evidence to link the 24.6 crore payment with the allotment of the coal block and this money was paid back with interest. Significantly, the last reason given by Mr. Sinha was not mentioned anywhere in the file. On the third case, he said prosecution case is very weak and marked it for the opinion of CBI’s senior counsel Mr. Amrendra Sharan. On 18th February 2014 DIG pointed out that Mr. Sharan has appeared on behalf of the Prakash Industries in Vijay Central and Urtan Coal Block cases and investigation against Prakash Industries is going on. DIG’s objection were overruled by Mr. Sinha on 21st February by stating that let Mr. Sharan be himself asked about this conflict. And on 24th February 2014 after some oral conversation with Mr. Sharan by the JD (Galhotra), the proposal of taking the opinion of Mr. Sharan was approved by Mr. Sinha. While the file was sent to Mr. Sharan, he and Mr. Darda met Mr. Sinha almost at the same time at Mr. Sinha’s residence on 26th February 2014. Mr. Darda according to the entry register met Mr. Sinha from 7 pm to 7.12 pm, while Mr. Sharan met him from 7.19 pm to 8.45 pm of 26th February 2014. On 18th March 2014, opinion of Mr. Sharan was submitted. Though the reference to Mr. Sharan in which a proposal was made for all the three cases as a combined charge-sheet, but Mr. Sharan confined his opinion to only one case in which charge sheet was recommended by ALA and left out other two on the ground that Director CBI has already taken final decision in those matters. He stated that deliberate mis-statement by the company would be an offence under Section 420 IPC and the role of the public servants needs to be examined under Sec 13 (1)(d) of PC Act. Even in respect to this one case, Mr. Sinha stated that opinion of Mr. Sharan is not clear and marked the file to the ALA. During this while, Mr. Devender Darda met Mr. Sinha on 13th and 21st March 2014. The ALA, now in a reversal of his stand, recommended closure of this case also on 24.03.2013. 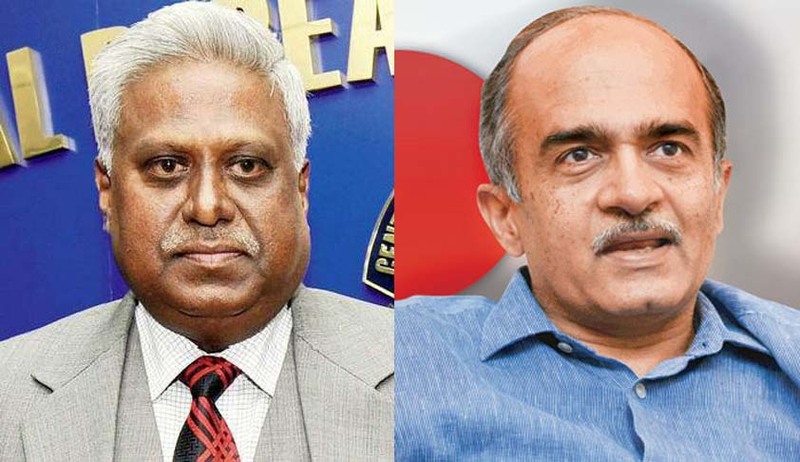 However on 25th March 2014 Joint Director observed on the file that he sticks to his earlier view of prosecution and so does AD-CBI who has recommended charge-sheet earlier. With these observations, the file was marked to Mr. Sinha. Under pressure, Mr. Sinha consented to a limited charge sheet being filed in one case against the Dardas while not charge-sheeting the Secretary Coal and MOS Coal and other Govt officials. On the other two cases, he insisted on the closure report being filed. Mr. Sinha again met Mr. Devender Darda on 28th March, 1st April and 28th April 2014 after the decision of filing closure report in 2 cases and chargesheet had been taken. Now, the closure reports filed by the CBI have all been rejected by the Ld. Special Judge who has directed further investigation into the matter. The Dardas and Mr. Sinha have not denied these meetings.